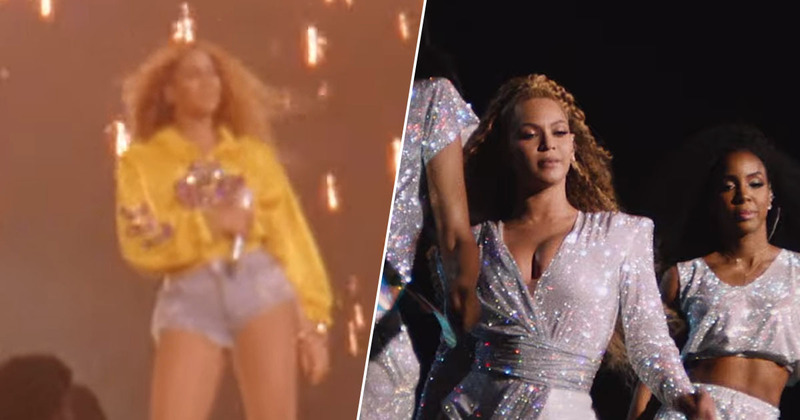 Netflix have just dropped the first full-length trailer for the upcoming documentary about Beyonce’s legendary Coachella set. Homecoming: A Film By Beyonce is the first time her iconic performance at last year’s festival will be available for viewing – in full at least. Queen Bey blew everyone’s socks off (do they wear socks at trendy Coachella?) with her performance, which marked the first time a black woman has headlined the festival. Initially live-streamed at the time, it was all anyone could talk about that week as Beyonce was joined on stage by her husband Jay-Z and sister Solange. My favourite moment though was when Michelle Williams and Kelly Rowland joined her for a Destiny’s Child reunion. Watching the trio perform Lose My Breath, Say My Name, and Soldier on stage together again sent shivers down my spine. I’m sure living rooms will be filled with Beyonce fans singing and dancing along when the documentary is released on the streaming service later this month. Last year Beyonce and Jay-Z also went on tour together, earning them an astonishing quarter of a billion dollars! According to Billboard, the ‘On The Run II Tour’ earned the superstar couple $253.5 million across 48 live shows, 18 in Europe and 30 in North America. The trek wrapped Oct. 4 at Seattle’s CenturyLink Field, the last of the 48 stadium dates they played, after beginning June 6 at the Principality Stadium in Cardiff, Wales. From there, the dynamic duo played 18 shows throughout Europe, peaking at London Stadium’s two-night engagement with $11 million grossed and more than 125,000 tickets sold. After a few final shows in France, including their debut performance of Apesh*t in Paris, they crossed the pond for 30 North American shows, with doubles in Landover, Md. ; East Rutherford, N.J.; Chicago; Atlanta; Houston; and Pasadena, Calif. The biggest earner of the tour was the Aug. 25-26 engagement at Atlanta’s Mercedes-Benz Stadium, grossing $14.1 million. That’s money I can’t get my head round to be honest! Homecoming: A Film By Beyonce will be available to stream on Netflix from April 17.